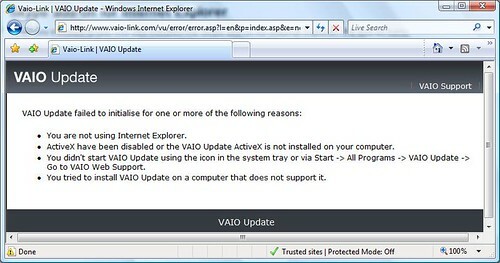 I received an email from Miel Van Opstal alerting me to the fact that NVIDIA has updated its video driver for the Vaio (Miel is the guy in charge of the Vaio Influencer program in Microsoft). Previously SecondLife refused to run on the Vaio because of video driver issues. Steve Clayton had kindly offered to help out at MIX07 but that won’t be necessary now because the new driver which Miel emailed me about, fixed the problem (after I uninstalled and reinstalled SecondLife and restarted the Vaio!). I have already wasted the morning grappling with Windows Live OneCare, I might as well blow the rest of the day now trying out SecondLife on Vista! 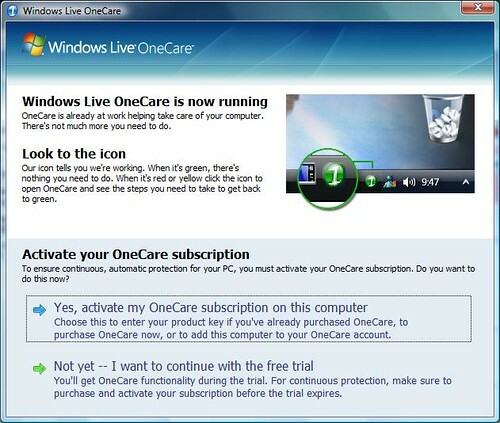 Windows Live OneCare is a fantastic idea. Write buggy insecure software and then charge the people who buy your software extra if they want to buy OneCare, which is supposed to protect them from the errors you created in the first place. Anyone else see a conflict of interest here? Why fix the software, when fixing it, only gives people a reason not to buy OneCare! 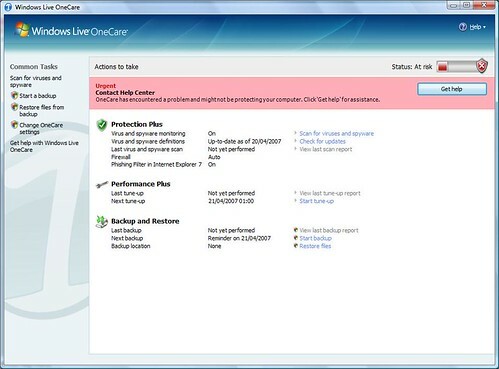 Anyway, a trial version of OneCare came on the Vista laptop that Microsoft sent me. This morning I was sent an Activation key to upgrade from the trial version to a full version. Excellent, that will get rid of the nagware screens Microsoft have in the trial version and allow me to update the virus definitions. Ah, the naivete, if only life (with Vista) were that simple. Three hours and countless restarts later I was still battling unsuccessfully to Activate OneCare. First off, if you want to go from the trial version to a full version you have to uninstall the trial version (requires a restart) and download and install the full version (requires a restart). Why? Why can’t you simply add an activation code to the trial version and it change automatically to the full version? When you click the Get Help button, you are brought to a screen which asks you what the error is! I dunno. You tell me. You are the one with the bloody problem. “OneCare has encountered a problem” doesn’t elicit any helpful responses unsurprisingly! I decided to make sure I had done a full uninstall. So I uninstalled OneCare (and restarted) and then I ran the OneCareCleanup tool (has to be run as Administrator and requires a restart). I then reinstalled OneCare and sure enough an Activation screen appeared – wohoo, I thought, success at last. Silly me. I clicked on the Activate button, the screen closed and nothing happened after that. I decided to try a restart as almost everything else in this process had required a restart! Still no joy. 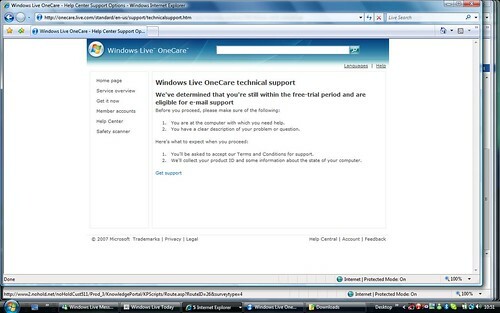 I tried going further in the Windows Live OneCare Support pages. Could I contact someone to help out? Of course not. Why? Because Windows Live OneCare determined that I was still in the Free Trial Period so I was only entitled to email support (24 hour turnaround). I love having lots of screen space. My MacBook Pro has a maximum screen resolution of 1440×900, which, while not great, is better than the 1280×800 maximum on the Vaio which Microsoft sent me. To get the most out of these screen resolutions on the Mac, I position the Dock on the right hand side and turn Hiding on. I put the Dock on the right (as opposed to the default option of the bottom) because the laptop display is widescreen. As a result, I have more horizontal than vertical space on the screen and most websites require more vertical than horizontal scrolling! It is possible to mirror this on Vista by sending the Taskbar to the right and turning on hiding, however when you do that, you immediately miss the clock! I don’t wear a watch and therefore always check the time on whatever computer I am on (and I make sure my computer synchs with a timeserver so the time is accurate!). 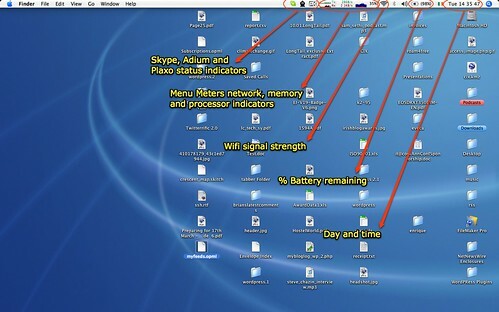 I miss not having all that information available at a glance, at all times, in Vista. I know it is a cliche that you don’t really realise just how much you love something until it is gone but I am proving that true with this move to Vista from OS X! What is it that I miss so much? ExposÃ©! ExposÃ© is a fabulous, much underrated feature of OS X whereby you can, at the click of a key or the flick of a mouse, expose all the windows you have open (or expose all the windows you have open for a particular app, or you can call up the desktop, or the screensaver). This is an incredible timesaving feature. I regularly have multiple emails open. The ability to hit F10 (or flick into the top left corner) to move between windows of just the Mail app, is fantastic. Similarly for browser windows, or any other app where you are likely to have multiple windows open and need to move between them. There are a couple of ExposÃ© clones out there for Vista but I have yet to find one which will emulate the app window tiling. It is taking me a while to get into this Vista machine. 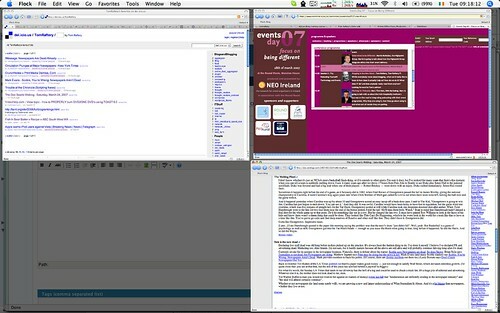 On the Mac, I live in browsers (I generally have 4 running) and email. The browsers on Vista are pretty much the same as they are on the Mac but the email experience is very different. The main choices I have for email client software are Thunderbird and Outlook 2007. I am using both for different email accounts and, frankly, I don’t like either! Thunderbird has already crashed on me so it is not that stable and Outlook hangs from time to time, seemingly contemplating the task I have just asked it to do, before finally snapping to attention and displaying my mail. Outlook also has an incredibly cluttered interface (seven panes) in comparison to the clean crisp interface of Apple’s Mail app. This can be very off-putting if you are not familiar with the program. I also hate the way Outlook deals with IMAP. I like it as a protocol but it is unusable in Outlook (if I delete an email, I want it to disappear, not stay in my inbox with a line through it). I originally set up my mail account in Outlook 2007 as IMAP but when I realised Outlook still deals poorly with IMAP I decided to switch to POP. This is where I hit another UI bug. Listen Microsoft, if the app is clever enough to know what I was trying to do, why not just do it, instead of forcing me to start all over again, the way Outlook wants me to do it? I have discovered another issue with Vista which may well be a bug. If not, then the OS is certainly not behaving as expected. On a pc the standard key combo for switching between apps and windows is Alt + Tab. Vista is no different. On holding down Alt and pressing Tab you are presented with a series of windows to chose between. Tabbing selects forward. Shift-tabbing selects back and where you stop, the selected window opens. But, you can also use your mouse to select out of sequence (if you don’t want to continue tabbing. Selecting the window with the mouse though does nothing. If you let go of the Alt key at this point, you won’t get the window you selected with the mouse opening up. What you have to do is click on the window you want to have open up. Why? Surely if I select it with the mouse, that should be enough to tell the OS that this is the window I want to have open. It is the little things like this guys which annoy users. UPDATE – post updated to correct the incorrect insertion of the image above. 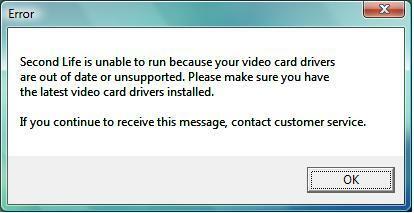 Completely my fault – nothing to do with Vista. Thanks to Tis me for letting me know about the error in the comments. This is my first blog post from within Vista – I’ll try to put up a post a day on the move across. Of course I am also moving from a Mac to a Sony Vaio so I will also be referencing that move in these posts. The first thing I had to do when moving from my Mac to this Vista machine was to decide on a Windows compatible RSS reader. I use NetNewsWire on the Mac. 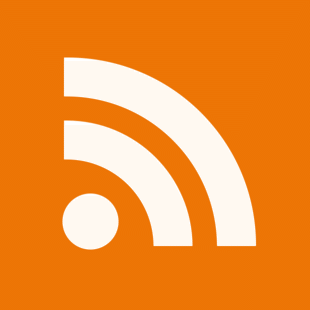 I quickly settled on Google Reader because I could quickly export my opml file from NetNewsWire, import it into Google Reader on the Mac, log into Google Reader on the Vaio and all my feeds were there. I realise NewsGator have an online reader which is sunched with my NetNewsWire which I could have used but Google Reader is the better product. 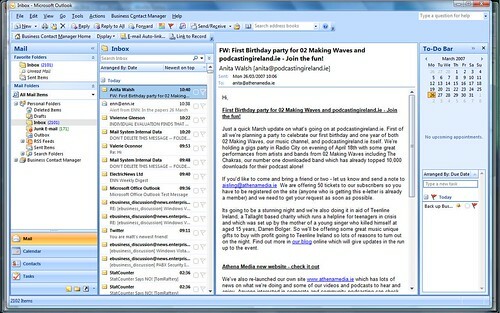 Then, I decided to try Outlook 2007 as my email client. The setup was painless enough (I went with IMAP so the mails will be left on the server and I will be able to retrieve them from the Mac if I revert!). However I did run into one very annoying issue with Outlook 2007. When I exported my OPML file from NetNewsWire, I asked it to keep the folder structure I had set up. Google recognised this structure no problem at all however Outlook ignored the structure and just brought in the feeds. Worse than that, if you want to delete the feeds from Outlook, you have to select the feeds individually. With several hundred feeds, this took some time. Grrrr. In fairness to Outlook though, I had exactly the same issues when I imported me feeds into Thunderbird. Annoying.